Georgie McCool finds herself making an impossible decision yet again. She and her writing partner Seth are finally getting their big break. But the meeting about their tv show has to happen over the Christmas holiday. Georgie knows that her husband Neal and their two daughters will be disappointed, but she is surprised when Neal takes the two girls and heads to see his family without her. The tension has been building between Georgie and Neal and she wonders if this is the final blow to her marriage. She crashes at her parent's house one night and makes a curious discovery - the old yellow phone in her bedroom connects her to her husband back when they were dating. Can she save her marriage in the present by making different choices in the past? Rainbow Rowell is mostly known for writing YA juggernaut Eleanor and Park. In Landline, we deal with a set of problems specific to adults - namely balancing professional dreams and family lives. Georgie and Seth have been writing funny things together since college. But late night writing sessions have cut into dinnertime and bedtime over and over again. This causes great tension in Georgie and Neal's marriage and in Georgie's own heart and mind as she has to choose time and again between her passion and the people she loves best. Most of the time, she finds that either decision leaves her unhappy. The central conceit here that Georgie could talk to husband in the past is a cute but fascinating way to have Georgie look back on the decisions she has made throughout her relationship. It's just a little touch of magical realism that gives Georgie (and us, along for the ride) the opportunity to see what choices work in a young relationship and which ones we regret with hindsight. There is such beautiful development in this story as we see Georgie grapple with her dream of being a writer in opposition to spending time with the family she loves so madly. She knows that her husband has been unhappy and at several points in the book, she wonder if she should let him go and let him be happy. Is love really enough? Landline's greatest strength is its insight into a marriage over time. While this novel is essentially a light read with a magical telephone, there were several moments when I caught my breath because Rowell explained marriage so perfectly. I loved reading Landline. I love that Rowell took a problem familiar to many of us as we try to balance work and family and refused to pass judgement. Instead, she lets us just live alongside Georgie as she makes her decisions, both good and bad. The characters, as always, are quirky and wonderful and my only regret is that I didn't get to spend more time with Georgie, Neal, Seth, and the others who live between the covers of Landline. There was so much that I enjoyed about this book. I read it, then listened to the audio of it, and it was listening to it that made me like the book a bit more. In the book I thought her two kids were whiny but the audio humanized them, and in the book it was *really* difficult for me to understand why Neal stayed with Georgie, but the audio humanized her a bit more, too. I wonder if that happens for a lot of audiobooks. Hearing an actual voice makes the characters seem like real people! I've been hesitant about picking up any Rainbow Rowell because I don't read a lot of YA but she is a fan favorite across the board. I think I am missing out on something by not giving her a try. Thanks for all the Rowell reviews. Maybe start with one geared towards adults? Attachments or Landline would be great choices! This is a fabulous review! I haven't read Landline yet, but it's on my list of soon-to-be-read books. * So far, I have been amazed by Rowell's perceptive writing. She just "gets" how real-life relationships work. *I'm in a reading slump right now, and honestly, nothing is looking appealing at the moment. Bummer! I hope you get through your reading slump soon. Maybe try re-reading something you loved? 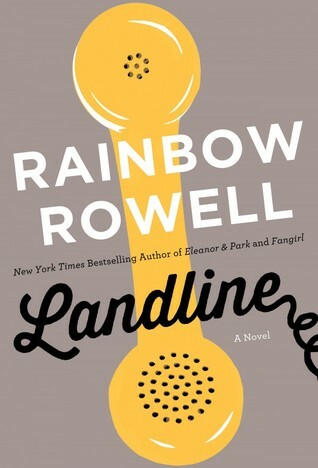 The way the marriage was portrayed in Landline is what I loved so much about the book, that and of course Rowell's writing. I'm glad you enjoyed this one, I was looking forward to your thoughts. Don't you think Landline is such a quotable novel? This was such a fantastic book! And even though I'm not married, I think I also gleaned some stuff about balancing my career with everything else. So it was helpful in that way as well as being just a good story. Yes, this was a book I didn't want to put down! My beef with many novels is that they all follow the same story arch: woman has husband who she doesn't connect with anymore, finally gets divorced, finds wonderful man, lives happily ever after. It just rarely happens that way in life. Like in your quote, it's like you have to have a surgeon "unthread your vascular systems." Not only that but second marriage is like the first in that you have to work at it just as much if not more--because now you have kids involved and an ex-husband to deal with. I find most stories very naive. This novel sounds different. I'd like to try it. I've heard so much of Rainbow Rowell, but have never read one of her books for myself. I like the way it sounds like this book balances between cute and thoughtful. That's a great way to put it. It's easy to read but full of so many things to consider about relationships. I love magical realism and from the reviews I've seen of this book, it sounds as though Rowell does a great job creating believable characters. I haven't read any of her books yet, but this is the one I'm most excited to pick up. Me too! When magical realism is done well, it's so fun and fascinating. I think this would be a great starting point for reading Rainbow Rowell.